A luxury yacht which was at the centre of Britain's largest drugs seizure has sold for £176,000 at auction. The Louise was impounded in Southampton two years ago after cocaine with a street value of up to £300m was found onboard. The drugs were found hidden in a compartment beneath the diving platform by UK Border Agency officers. The the 65ft pleasure cruiser went under the hammer in Northern Ireland on Friday night. The vessel was discovered in Southampton aboard a container ship along with other luxury cruisers arriving from the Caribbean. It took six days to find the 90% pure drugs destined for the Netherlands, via England, which had been packed inside the boat while it was in Venezuela. Following a trial in Rotterdam last year, three Dutch men were jailed for a total of 20 years. 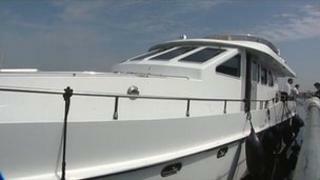 The vessel, which has been impounded in Southampton since the seizure, was sold under the Proceeds of Crime Act. The money generated is used to compensate victims and help fund crime-fighting initiatives.